Volume 5 of the Digital Painting Techniques series. This is yet another insightful learning resource for all digital painters. I probably can say that for all volumes after the first one came out. The topics in this volume focus on weapon design (sci-fi guns), creatures from mythology (think Magic The Gathering), cartoon character styles, battle scenes, painting materials, custom Photoshop brushes and digital painting over 3D models. The artists are each given a project and they talk about the process of creating their artworks from conceptualisation, creation to completion. The commentary is insightful, informative and filled with useful tips and tricks. Using their own artworks as examples, they touch on things like researching, the handing of foreground background, creating areas of contrast, leading the eye or the handling of colour. It's a very artist-centric approach. The tutorials are quite detailed, as usual. They are mostly using Photoshop but the techniques can probably be used with other painting softwares, with the exception of those Photoshop custom brush tutorials. Tutorials files can be downloaded from publisher 3DTotal's website. 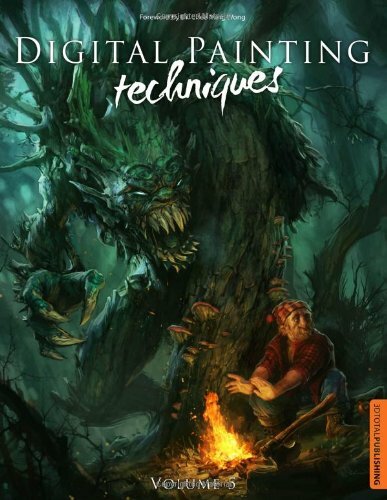 It's a great instructional book on digital painting. It's invaluable to learn from the pro artists featured. The book has 288 pages.